Phylogenetic studies of the family Arthrodermataceae have revealed seven monophyletic dermatophyte clades representing the genera Trichophyton, Epidermophyton, Nannizzia, Lophophyton, Paraphyton, Microsporum, and Arthroderma. Members of the genus Nannizzia are geo- or zoophiles that occasionally infect humans. With the newly proposed taxonomy, the genus Nannizzia comprises thirteen species, i.e., Nannizzia aenigmatica, N. corniculata, N. duboisii, N. fulva, N. graeserae, N. gypsea, N. nana, N. incurvata, N. perplicata, N. persicolor, N. praecox, and two novel species. Nannizzia polymorpha sp. nov. was isolated from a skin lesion of a patient from French Guiana. For the strain originally described as Microsporum racemosum by Borelli in 1965, we proposed Nannizzia lorica nom. nov. The species are fully characterized with five sequenced loci (ITS, LSU, TUB2, RP 60S L1 and TEF3), combined with morphology of the asexual form and physiological features. A key to the species based on phenotypic and physiological characters is provided. Dermatophytes are keratinophilic fungi that affect nail, hair, and skin of humans and warm-blooded animals. Approximately 20–25% of the global human population is infected with a dermatophyte at least once per lifetime . About thirty clinically relevant dermatophyte species are known, but their taxonomy has been controversial because of incongruence of phenotypic and molecular characters . In a historical overview of dermatophyte taxonomy , four periods were distinguished, based on methods and main criteria used for species discrimination: clinical features only (1840–1895), clinical features combined with phenotypes in culture (1896–1955), mating (1956–1990), and molecular sequencing (1991–today). The highest number of species names (350) was reached around 1950, when novel taxa had been introduced for clinical and morphological variants. A second but much smaller peak of introductions of new names was reached when sexual morphs of these fungi were discovered which were described as separate entities in accordance with current dual nomenclature of fungi. Today, with the introduction of molecular methods, we realize that clinically relevant dermatophytes are phylogenetically more closely related than what was anticipated. As a consequence, the number of recognized species has been greatly reduced; particularly, in anthropophilic dermatophytes numerous taxa have been synonymized with preexisting entities. In 2016 and 2018, comprehensive multilocus phylogenetic studies of Arthrodermataceae were published [3, 4] with a phylogeny that in main traits reflected ecological preferences of species in prevalent host animal and environmental habitats. Seven groups were found to be monophyletic and were accepted as genera; among these were Nannizzia and Arthroderma, names that had previously been reserved for sexual states of members of the family. Precise species delimitation using a polyphasic approach is a subsequent step in revising the taxonomy of Arthrodermataceae. The genus Nannizzia was introduced by Stockdale  with Nannizzia incurvata as type species to accommodate microsporum-like species producing gymnothecia, which had been discovered earlier, for example, by Nannizzi (1927). The sexual state is covered by spirally twisted peridial hyphae composed of ossiform cells and contains spherical, evanescent asci containing one-celled, lenticular ascospores. The asexual state is characterized by multiseptate, thin- to rather thick-walled, ornamented macroconidia. Through systematic mating experiments on keratinous media, Stockdale  discovered the sexual states in fungi previously known as Microsporum fulvum (Uriburu 1909) and M. gypseum (Guiard and Gregorakis 1928). In accordance with prevailing nomenclatural rules, these taxa received additional teleomorph names as Nannizzia fulva and N. gypsea. Most of the species that were classified in the genus Nannizzia were described with double nomenclature after finding the heterothallic sexual form. Nannizzia persicolor  was introduced for Trichophyton persicolor (1910). The sexual species Nannizzia corniculata was synonymized as Arthroderma corniculatum ; according to Weitzman et al. , Nannizzia and Arthroderma were congeneric and priority was given to Arthroderma since the name preceded Nannizzia with more than 100 years. Today, with molecular as the leading classificatory principle, Nannizzia and Arthroderma are separated as two independent, holomorphic genera: Arthroderma covers a large group of ancestral, mainly geophilic species , while Nannizzia is located between Trichophyton and a preponderantly zoophilic genus, Microsporum. Several species were found to cluster in the well-demarcated Nannizzia group, such as N. nana , formerly known as Microsporum nanum , Nannizzia duboisii , known as Microsporum duboisii , and Nannizzia praecox , known as Microsporum praecox . The recent addition to the genus were the non-sporulating species Microsporum aenigmaticum , renamed as Nannizzia aenigmatica, Nannizzia graeserae recovered from soil sample in India, and N. perplicata isolated from a case of tinea corporis [3, 14, 15]. The abandoned dual nomenclature in fungi has a profound impact on naming of dermatophytes. The genus Nannizzia was initially introduced to describe sexual states of known dermatophytes revealed after mating. Dried type materials, usually consisting of two strains of opposite mating type, and the resulting sexual state were deposited in herbaria, while the living strains were maintained as asexual types in reference collections. Descriptions of the anamorphs were mostly much older, taxa being erected in a time when material of medical strains was only rarely preserved. Those identities are unclear; the historical anamorph species may not have been identical with the deposited sexual species. For practical reasons and necessity, de Hoog et al. took the sexual names as nomenclatural reference. The aim of the present revision is to fully characterize all Nannizzia species in a modern sense, combining phenotypic features with molecular data. In the course of this study, we found two strains in the CBS reference collection that represented undescribed species in Nannizzia, i.e., CBS 450.65, deposited as type of Microsporum racemosum, and CBS 121947, maintained as Microsporum amazonicum. The study offers a comprehensive taxonomic overview of the whole genus with unambiguous identification tools for species recognition in the clinical laboratory. All analyzed strains were taken from the CBS reference collection (housed at Westerdijk Fungal Biodiversity Institute, Utrecht, The Netherlands). The total number of strains identified by their ITS sequence and tested for physiology was 56 (Table 1), with a subset of 32 strains selected for multilocus phylogeny. Nannizzia fulva and N. gypsea were represented with 10 strains each, followed by N. incurvata with 9 strains, N. persicolor and N. nana with 7 strains each, N. praecox with 6 strains, and N. corniculata with 3 strains. For four species, i.e., N. aenigmatica, N. lorica, N. duboisii, and N. polymorpha, only a single strain per species was available. N. graeserae and N. perplicata were not included in the analysis because of unavailability of the strains, but their sequences were added to the single-gene phylogenetic tree. Strains were cultured on Sabouraud’s glucose agar (SGA) plates, using lyophilized, cryo-preserved or fresh mycelial material as inocula. Most of the cultures were incubated for 7–14 days at a temperature of 24 °C. DNA was extracted from cultures grown on SGA plates using MasterPure™ Yeast DNA Purification Kit from Epicentre (Madison, WI, USA). Molecular studies were performed on five gene regions for 32 strains including: ITS, LSU, partial β-tubulin (TUB2), translation elongation factor 3 (TEF3), and 60S ribosomal protein L10 (RP 60S L1) . The equipment and PCR conditions used for all five loci were performed as described in Stielow et al. . The same loci were utilized to infer the phylogeny of the onygenalean families Arthrodermataceae  and Ajellomycetaceae . Obtained sequences were manually edited and stored in a Biolomics database maintained at Westerdijk Institute . For subsequent phylogenetic and molecular studies, sequences were aligned in five data sets using Mafft version 7 with default settings . The identity matrix of BIOEDIT software version 7.2 was used to calculate the percentage of similarity between sequences of the type trains as representatives of the species for all five loci. The concatenated dataset of 32 Nannizzia strains with out-group Epidermophyton CBS 230.76 was created using SequenceMatrix software  and subjected to phylogenetic analysis using maximum likelihood (RAxML v.8.0.0) employing GTRCAT model and 1000 bootstrap replicates (BS) . A dataset of 239 ITS sequences of strains from Arthrodermataceae was subjected to a phylogenetic analysis using the same software and parameters as for the concatenated dataset to confirm monophyletic nature of the genus Nannizzia within Arthrodermataceae and the phylogenetic position and relationship of its species. Phenotypic and growth characteristics of the isolates were studied on SGA and 2% malt extract agar (MEA, Oxoid, UK) plates incubated for 3 weeks at 27 °C. Cultures were assessed weekly, and colony characteristics including morphology, color of mycelia, and exuded pigmentation were recorded. Microscopic features were studied using a slide culture method on SGA and MEA agar blocks. Slides were mounted in clear lactic acid and examined using a differential interference contrast microscope (Nikon Eclipse 80i, Nikon, Japan) equipped with Nikon digital sight DS-5 M camera. Micrographs and measurements were taken using NIS Elements imaging software with a minimum of 10 measurements per structure. Photomicrographs were adjusted and assembled in Adobe Photoshop v. CS5.1. All 56 strains were tested for seven physiological parameters. Data were recorded at two time points, i.e., on days 7 and 14. The ability to hydrolyze urea was tested in Christensen’s urea broth (CUB). After inoculation, the cultures were incubated at 24 °C in the dark. A color change from orange to pale pink, red or purple indicated the production of urease. 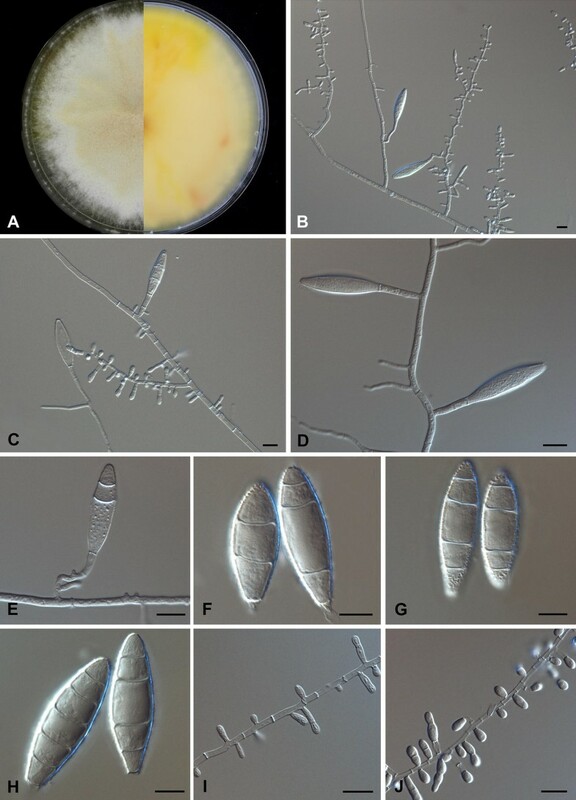 Trichophyton mentagrophytes CBS 318.56 was used as positive control . Lipase activity was tested on Tween 80 opacity test medium (TOTM) . Strains that formed a halo of crystals around the colony were considered positive. Growth and color change from yellow (acidic) to red (basic) was followed on dermatophyte test medium (DTM). Milk hydrolysis (pigment production) was tested on bromocresol purple–milk solids–glucose agar (BCP-MS-G) according to Fisher and Kane . Positive strains change the color of the medium due to casein hydroxylation, resulting in a dark purple-blue color of the agar . Beta-hemolysis was tested on sheep blood agar plates (BioMerieux, France). Plates were incubated at 37 °C, and positive response was recorded as a transparent zone of clearing. Tolerance to cycloheximide and sodium chloride (NaCl) was tested on SGA plates supplemented with 0.2% cycloheximide and 3% and 5% NaCl. Cardinal temperatures and growth rates for novel taxa were determined on MEA plates at 6–36 °C with 3 °C intervals, and at 37 and 40 °C, measured at day 7 and day 14 of incubation. An ML phylogenetic study on the ITS dataset confirmed the topology found by de Hoog et al. . All species included in the current study clustered in a group defined by Nannizzia incurvata as type species, although with slightly low bootstrap support (61%, Fig. 1). The bootstrap support was higher (83%) before the addition of the newly described species, N. graeserae and N. perplicata. A five-locus alignment matrix was generated for 32 Nannizzia strains covering ITS (591 bp), and partial LSU (810 bp), TUB2 (448 bp), TEF3 (266 bp), and RP 60S L1 (461 bp). GenBank accession numbers of all sequences are given in Table 1, and the resulting ML phylogenetic tree is presented in Fig. 2. The topologies of bootstrap-supported branches of the trees are highly corresponding. Strain CBS 134549 of N. aenigmatica grouped with CBS 450.65 (named below as N. lorica) at some distance of the core group (Clade B) with 100% BS support and containing N. gypsea. Clade A (BS 99%) is sister to Clade B and comprised N. fulva and N. corniculata. Nannizzia duboisii and N. incurvata (Clade C, BS 100%) are basal to Clades A and B, but cluster with them in a 100% BS-supported node. Nannizzia praecox and N. persicolor, each forming their own subclades with BS of 100%, formed a separate clade (Clade D, BS 97%), while Nannizzia nana (Clade E, BS 100%) and N. polymorpha took an ancestral position to all species. All branches between clades had BS support values higher than 70%, except for the lowest branch connecting N. polymorpha to remaining species; the position of this single strain is uncertain also in the single-gene tree and may be due to the long branch attraction. The BS values of all clades representing species with more than 2 strains (seven species) are 100% in the multigene tree. The identity matrices of the ITS, LSU, TUB2, RP 60S L1, and TEF3 sequences of type strains are given in Supplementary Table 1. Fifty-five pairwise comparisons between three intervals (≥ 96%, 91–95% and ≤ 90%) are summarized in Table 2. Low sequence similarities were recorded for BTUB2 and RP 60S L1, i.e., 37 and 38 in interval ≤ 90%, 18 and 17 in interval 91–95%, respectively. No similarity ≥ 96% was found with these loci. In ITS, 31 pairwise comparisons were ≤ 90%, 23 were in the interval 91–95%, and one in ≥ 96%. TEF3 had no comparisons in the group of ≤ 90%, 31 were in the interval 91–95%, and 24 in the group ≥ 96%. With the LSU locus, all species showed very high sequence similarities, with 100% identity in 13 comparisons. Results of physiological tests are given in Table 3. All strains grew on dermatophyte test medium, changing the color from yellow to red. In addition, all strains showed growth when cultured on SGA supplemented with 0.2% cycloheximide, or with 3% and 5% NaCl. Contrary to these uniform results, remaining physiological tests (urease production in CUB, lipase activity on TOTM, milk hydrolysis on BCP-MS-G, β-hemolysis on blood agar, and temperature relations) yielded intraspecific variation in species where more than one strain was available for study. All strains, except N. fulva CBS 287.55 and N. corniculata CBS 364.81, were urease positive (purple color) after 2 weeks of incubation. Different results at day 7 and day 14 were recorded for all species represented by more strains except for N. praecox, where all six strains were positive in one week. All strains of N. fulva, N. corniculata, and N. incurvata were positive for lipase forming clear halos around colonies, but strains of N. praecox were negative. In most of the cases, however, no clear halo was visible, but crystals could be observed in the agar under the colony. Nine out of 10 N. gypsea strains were positive after 14 days, while one (CBS 120675) remained negative at both time points. Three strains of N. persicolor showed negative reaction after 7 days, but all were positive at day 14 of growth. Five N. nana strains were positive, and two showed negative to weak reactions on day 7 and day 14, respectively. Milk hydrolysis test was negative for all N. corniculata strains and for all N. praecox strains. For all other species, this test proved to be highly variable. The color change on BCP-MS-G medium was not obvious as most species exuded pigments into the medium which interfered with reading. β-Hemolysis was not observed in all tested species except for six strains of N. nana, and the single strains of N. aenigmatica and N. duboisii. The positive N. nana strains showed β-hemolysis only after 14 days; one strain remained negative. Nannizzia duboisii CBS 349.49 was also positive only after 14 days, while N. aenigmatica was positive at both recording points. Growth at 37 °C was observed in N. corniculata, N incurvata, N. persicolor, N. lorica, and N. polymorpha, while 6 strains of N. fulva and the strains of N. praecox and N. aenigmatica showed no growth. N. duboisii, two strains of N. gypsea and one strain of N. nana, showed no growth at day 7 and poor growth at day 14. The genus Nannizzia is characterized by expanding cottony to powdery colonies which can be creamy whitish, yellow, orange, brown, or reddish. The colony reverse usually shows bright yellow, orange, or reddish brown pigmentation. 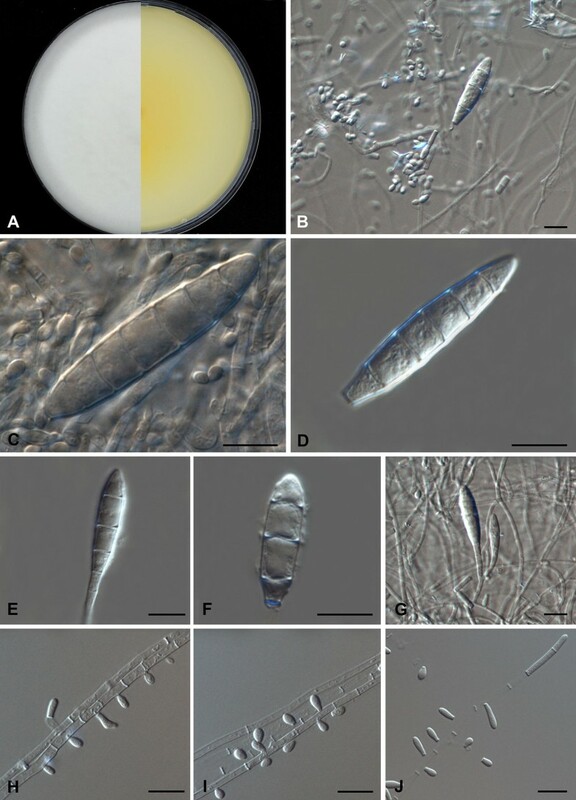 The asexual form has abundant, 1–8-septate, thin- or moderately thick- and rough-walled macroconidia which are cylindrical, cigar-shaped, ellipsoidal or fusiform, although in N. aenigmatica and N. lorica sporulation is not known. Microconidia are aseptate or rarely with one septum, arranged individually or in small clusters, sessile or short-stalked, clavate or obovoidal with truncate base, usually abundant, but scant in N. aenigmatica and N. praecox. The fungi are heterothallic; ascomata are gymnothecia which are morphologically highly monomorphic in Arthrodermataceae. In clinical practice, the genus Nannizzia differs from Lophophyton, Microsporum, and Paraphyton by relatively thin-walled macroconidia, and from Lophophyton by maximally 8-septate against up to 11-septate macroconidia. 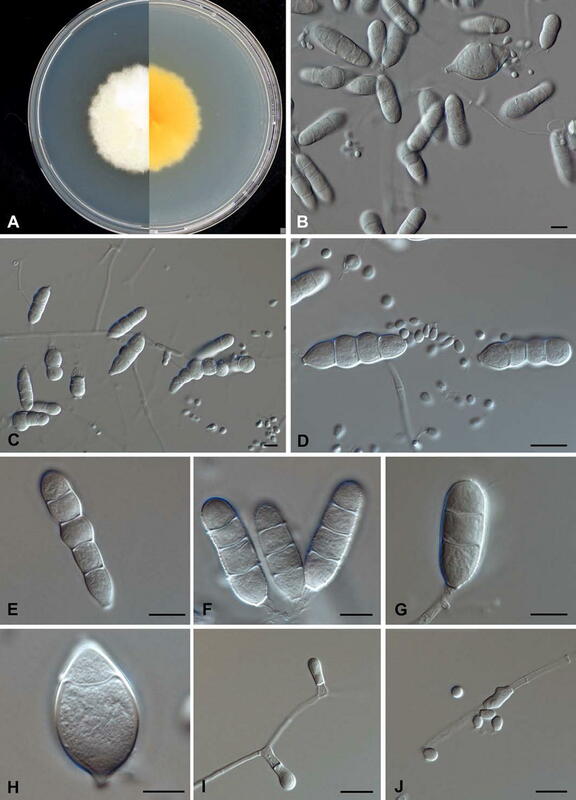 Trichophyton differs by having scant, thin- and smooth-walled macroconidia. Some species of Arthroderma are similar to, but differ from Nannizzia by the shape, the wall thickness, and the number of septa. Epidermophyton is easily distinguished by the absence of microconidia and smooth-walled macroconidia. Nannizzia aenigmatica (Hubka, Dobiášová, and Kolařík) Gräser and de Hoog: MycoBank MB824533; Fig. 3. Type: CZECH REPUBLIC, Ostrava, skin lesion on the wrist of a woman, S. Dobiášová; culture ex-type CCF 4608 = CBS 134549. Colonies on SGA circular, flat, radially or irregularly furrowed, pale ochraceous with some brownish sectors, slightly zonate with dark yellow margin consisting of submerged mycelium; reverse dark yellow-orange. Colonies on MEA circular with cottony aerial mycelia, creamy white or pale ochraceous; reverse yellow-orange in the center becoming faint toward the margin. Hyphae septate, hyaline to pale yellow, smooth-walled, sometimes curved and intertwined forming dense masses, racquet hyphae present. Macroconidia not observed. Microconidia rare 4–5 × 2.5–3 µm, formed on undifferentiated hyphae, ovoidal or clavate. Chlamydospore-like structures abundant. Urease positive, lipase positive, milk hydrolysis negative to weakly positive, β-hemolysis positive, no growth at 37 °C. Nannizzia corniculata Takashio and De Vroey: MycoBank MB110836; Fig. 4. Type: SOMALIA, Las Anod, soil, 1966, Ch. De Vroey and M. Takashio, culture ex-type CBS 364.81 = ATCC 46541 = IHEM 4409 = RV 20845. Colonies on SGA pale yellow buff, circular, woolly and downy; reverse yellow. Colonies on MEA circular, creamy white powdery; reverse yellow-orange. 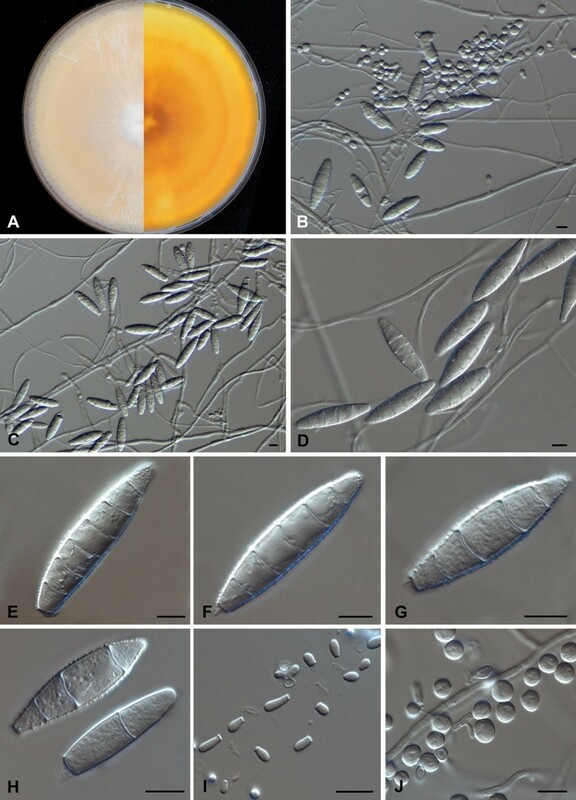 Macroconidia 28–62 × 8–10 µm, 1–8-septate, straight or slightly curved, thin- or moderately thick-walled, echinulate, cigar-shaped or narrow cylindrical with pointed or round apex, borne on unbranched or branched conidiophores. Microconidia 4–8 × 2–3 µm, sessile or short-stalked, single-celled, clavate. Urease variable, lipase positive, milk hydrolysis negative, β-hemolysis negative, growth at 37 °C. Type: ZAIRE, Kangu, skin of infant, R. Vanbreuseghem, culture ex-type CBS 349.49. Colonies on SGA circular, creamy white, velvety to woolly or powdery; reverse yellowish. Colonies on MEA creamy white, velvety with thin cottony margin; reverse yellow-orange. Macroconidia 2–6-septate, 25–41 × 7–10 µm, rough-walled, thin- or moderately thick-walled, fusiform with pointed apex. Microconidia 4–5 × 2–3 µm, sessile alongside undifferentiated hyphae or stalked, clavate to obovoidal, sometimes present in small clusters. Chlamydospore-like structures present. Urease weak to positive, lipase positive after 2 weeks, milk hydrolysis negative, β-hemolysis positive after 2 weeks, poor growth at 37 °C. Nannizzia fulva (Uriburu) Stockdale: MycoBank MB335065; Fig. 6. Type: ARGENTINA, from human, E. Rivalier, culture ex-type CBS 287.55. Colonies on SGA beige buff to pink buff, finely or coarsely granular, farinose, circular or irregularly radiating, flat or heaped and convoluted at the center causing cracks in the agar; reverse buff orange to reddish brown at the center. Colonies on MEA beige buff, powdery at the center with a white cottony periphery, circular; reverse buff orange or red. Macroconidia 26–64 × 10–12 µm, 3–7-septate, thin- or moderately thick-walled, verruculose, usually elongated fusiform or lanceolate to cylindrical and slightly tapering toward each end, borne on short, unbranched or branched conidiophores, some strains produce coherent non-maturating elongated conidia. Microconidia scant, 3–4 × 2–3 µm, sessile or short-stalked, 0–1-septate, obovoidal or clavate, borne on cylindrical or slightly swollen hyphae. Spiral hyphae present. Urease and milk hydrolysis variable, lipase positive, β-hemolysis negative, growth at 37 °C negative to poor. Nannizzia gypsea (Nannizzi) Stockdale—MycoBank MB33506; Fig. 7. Type: AUSTRALIA, New South Wales, Turramurra, soil, 1960, D.M. Griffin, culture ex-type CBS 258.61 = CBS 169.64 = IMI 80558. Colonies on SDA radiating, deep cream, yellowish buff or tan, coarsely granular or powdery; reverse yellowish buff with some pinkish tinges. Colonies on MEA dark cream to yellowish or pale buff, radiating, granular, some cultures form white cottony or fluffy tufts of aerial mycelium; reverse buff with yellowish brown or reddish brown pigmented spots. 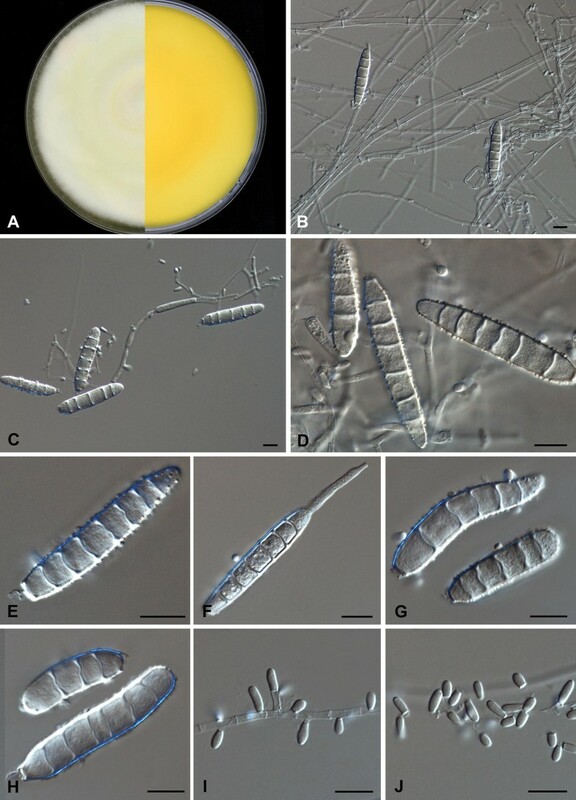 Macroconidia 33–48 × 13–16 µm, 2–5-septate, symmetrical, broadly ellipsoidal to fusiform, tapering toward the ends and slightly rounded at the apex, thin-walled, verrucose, borne individually on short branches alongside hyphae or in clusters. Microconidia 4–10 × 2–6 µm, sessile or stalked alongside undifferentiated hyphae, obovoidal or clavate, 0–1-septate. Urease weak to positive, lipase and milk hydrolysis variable, β-hemolysis negative, growth at 37 °C positive with the exception of two strains with no or poor growth. Nannizzia incurvata Stockdale: MycoBank MB335068; Fig. 8. Type: UK, human skin, P.M. Stockdale, culture ex-type CBS 174.64 = IMI 82777 = NCPF 236. Colonies on SGA pale brown to buff, powdery or finely granular with some white tuft cottony mycelia at the center; reverse orange or reddish yellow or cinnamon. Colonies on MEA circular, creamy to pale buff, powdery with some white tuft cottony mycelia; reverse reddish yellow or cinnamon. Macroconidia 36–64 × 9–15 µm, 1–6-septate, thin- or moderately thick-walled, verrucose, fusiform, formed on unbranched or repeatedly branched conidiophores. Microconidia 4–8 × 2–7 µm, subspherical or clavate, sessile alongside undifferentiated hyphae. Urease and milk hydrolysis mostly positive, lipase positive, β-hemolysis negative, growth at 37 °C positive. Nannizzia lorica Dukik, S.A. Ahmed and de Hoog, nom. nov.: MycoBank MB825523; Fig. 9. Etymology: The species epithet refers to the source, mammal fur, from which the type strain was recovered (Rattus rattus). Type: VENEZUELA, hair of Rattus rattus, D. Borelli, culture ex-type CBS 450.65 (type of Microsporum racemosum). Colonies on SGA white to pale buff, radiating, velvety or powdery; reverse reddish brown. On MEA creamy white, cottony to finely granular; reverse faint yellow. Macroconidia not observed when the type strain was examined. 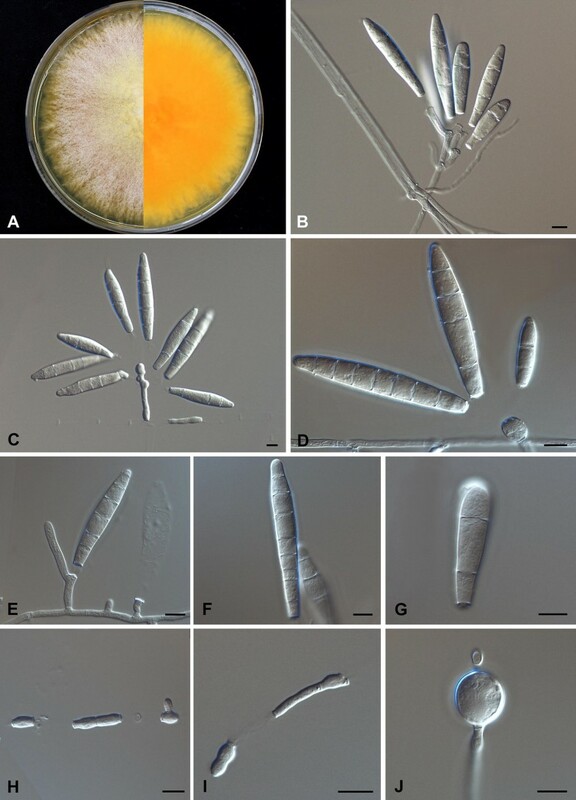 In the original description by Borelli , macroconidia was reported “1–5, rarely 6-septa, thin- or moderately thick-walled, echinulate, fusiform, 55–65 × 12–15 µm.” Microconidia abundant, hyaline, in various sizes and shapes but mostly ovoidal to clavate, born single or in grapelike clusters. Optimum temperature 27 °C, colony reaching 70 mm diameter after 2 weeks. Urease positive, lipase negative, milk hydrolysis negative, β-hemolysis negative, growth at 37 °C positive. Nannizzia nana (Fuentes) Gräser and de Hoog: MycoBank MB554303; Fig. 10. Type: Country UNKNOWN, kerion of human scalp, C.A. Fuentes, culture ex-type CBS 314.54 = ATCC 11832. Colonies on SGA expanding and radiating, creamy white or light buff, cottony or powdery; reverse dark brown to reddish brown at the center. Colonies on MEA white pale yellow or buff, powdery to velvety at the center and white cottony toward the margin; reverse orange. Macroconidia 13–29 × 8–13 µm, 1- or rarely 2-septate and sometimes aseptate, thin-walled, verrucose with some warty projections, obovoidal to clavate, with truncate bases. Microconidia 3–7 × 2–3 µm, sessile, ovoidal, or clavate. Urease mostly positive, lipase positive or weak, milk hydrolysis variable, β-hemolysis mostly positive after 2 weeks, growth at 37 °C positive with the exception of one strain with none to poor growth. Nannizzia persicolor (Padhye, Ajello, and McGinnis) Gräser and de Hoog: MycoBank MB33507; Fig. 11. Type: BULGARIA, human skin lesion, V.A. Balabanov, culture ex-type CBS 871.70. Colonies on SGA expanding pale yellow, circular, flat, velvety or fluffy powdery; reverse brownish red or orange red at the center becoming faint toward the margin. Colonies on MEA granular, pale yellowish buff at the center with cottony, white margin; reverse ochraceous. Macroconidia 24–58 × 6–10 µm, 3–7-septate, thin- and rough-walled with scattered warty projections, elongated fusiform to cigar-shaped. Microconidia 3–6 × 2–4 µm, ovoidal, (sub)spherical, sessile, mostly in clusters. Spiral hyphae present. Urease mostly positive or weak, lipase positive (some strains turned positive only after 2 weeks), milk hydrolysis on BCP-MS-G negative or weak, β-hemolysis negative, growth at 37 °C positive. Nannizzia polymorpha Dukik, S.A. Ahmed and de Hoog, sp. nov.: MycoBank MB825465, Fig. 12. Etymology: The species epithet refers to the morphologically variable conidia that characterize the species. Type: FRENCH GUYANA, human skin lesion, N. Contet-Audonneau, Holotype CBS-H-23607, culture ex-type CBS 121947. Colonies on SGA circular, yellow buff, powdery or lanose with fluffy tuft aerial mycelia; reverse yellow. Colonies on MEA creamy white, radiating, granular, cottony; reverse dark yellow. Hyphae hyaline, septate, spiral hyphae present. Macroconidia thin- or moderately thick-walled, smooth-walled or slightly verrucose, borne on branched or unbranched conidiophores, while some are sessile and arrange individually or in clusters. Two types of macroconidia were present: abundant type, 16–59 × 7–17 µm, with 1–4 or rarely 5 septa, cylindrical or clavate with blunt rounded or slightly pointed apex, mostly on clusters. Rare type, 23–43 × 15–29 µm, 0–1-septate, ovate egg-shaped or obpyriform with a tapering pointed or slightly rounded apex. 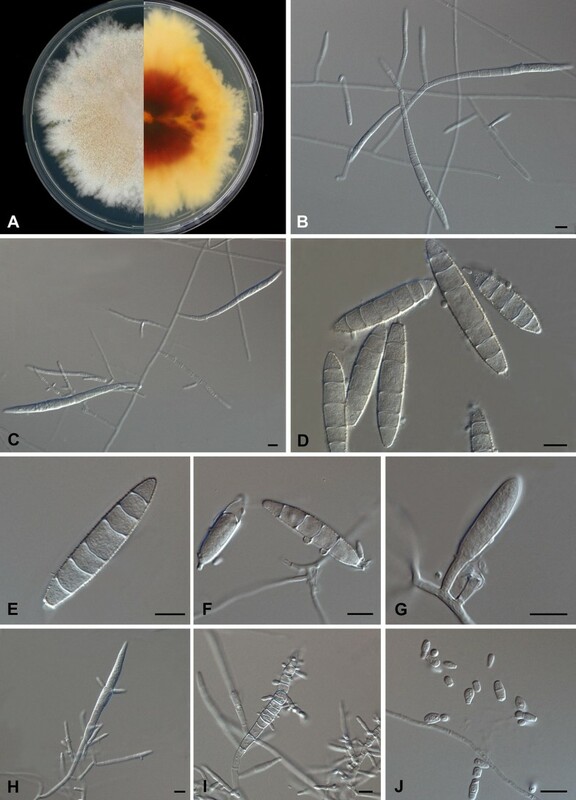 Microconidia 3–10 × 7–15 µm, sessile or short-stalked, 0–1-septate, arranged mostly in small clusters but also alongside undifferentiated hyphae. Chlamydospore-like structures present. Urease positive, lipase positive after 2 weeks, milk hydrolysis positive, β-hemolysis negative. Optimum growth temperature 30 °C, colonies reach 68 mm diameter after 2 weeks, growth at 37 °C positive. Nannizzia praecox (Rivalier ex A.A. Padhye, Ajello, and McGinnis) Gräser and de Hoog: MycoBank MB 629706; Fig. 13. Type: FRANCE, skin lesion on the wrist of a man, Rivalier, culture ex-type CDC B-4819D = ATCC 66852, authentic strain CBS 288.55, ex human, Rivalier. Colonies on SGA creamy to yellowish tan or buff, radiating, granular or powdery with suede-like cloudy growth waves; reverse yellow-orange. On MEA buff, powdery to finely granular with cottony white tuft aerial mycelia; reverse yellow-orange. Macroconidia abundant, 29–80 × 11–13 µm, 3–8-septate, thin- and rough-walled, long ellipsoidal or cigar-shaped or sometimes clavate, often borne on complex branched conidiophores. Microconidia rarely present, 6–14 × 4–10 µm, thin-walled, sessile, 0–1-septate, pyriform or clavate. Chlamydospore-like structures present. There was no intraspecific variability in this species; urease positive, lipase negative, milk hydrolysis negative, β-hemolysis negative, no growth at 37 °C. 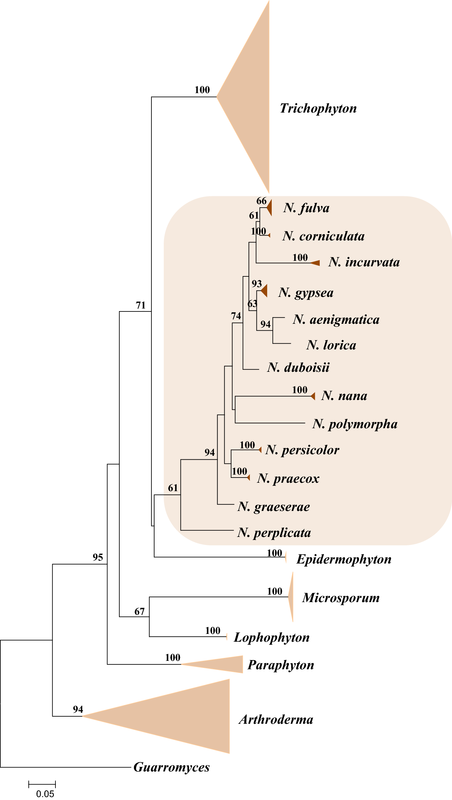 For descriptions of N. graeserae and N. perplicata, see references  and . The molecular phylogeny of the family Arthrodermataceae corresponds in main traits with the classical ecological grouping of dermatophytes into geo-, zoo-, and anthropophilic species. Anthropophilic species are restricted to the genera Trichophyton and Epidermophyton, while geophilic species are mainly found in the genera Arthroderma and Nannizzia. Zoophilic dermatophytes, i.e., species prevalently found in the fur of a particular (group of) mammal host species, are difficult to define, as also geophilic species can be carried asymptomatically by burrowing animals. 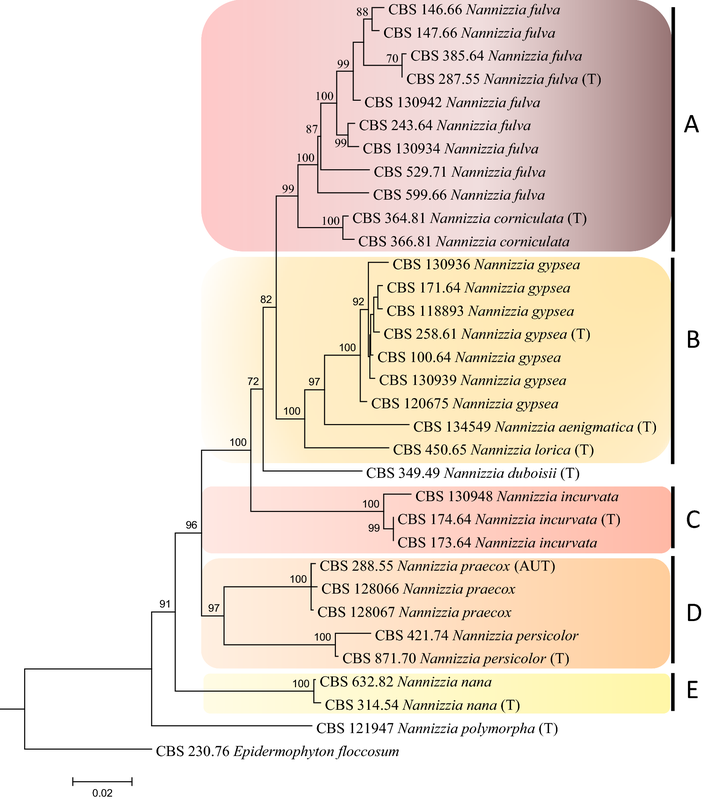 Several members of the genus Nannizzia have been associated with particular mammal hosts, although some are found in soil or causing infections in humans; hence, they are considered as opportunistic pathogens. The overall estimated prevalence of human infections caused by species of the N. gypsea complex (N. gypsea, N. fulva, and N. incurvata) in Europe is around 1% of all dermatophytosis . In humans, they mainly cause tinea corporis [28, 29, 30]. A specific clinical feature seems to be a white, paint-like scale on the scrotum [31, 32, 33]. Cases in immunocompromised patients such as with HIV or lupus tend to be severe [34, 35]. Nannizzia persicolor was isolated from European bank and field voles , and it is occasionally causing tinea corporis, tinea capitis, or tinea pedis in humans [37, 38, 39]. Although Muller et al. reported 16 cases of dermatophytosis in dogs due to this species, no human infection acquired via contact with symptomatic or asymptomatic domestic animals was noted. In India, N. persicolor is the prevalently isolated species of Nannizzia from soil . In contrast, Nannizzia praecox has been described as rare cause of human skin lesions , causing tinea corporis and tinea capitis . Most of the infections are reported to be acquired from the equine environment [42, 44, 45]. Nannizzia corniculata is a geophilic and has not been encountered as a pathogen . Nannizzia lorica was first isolated from an asymptomatic rat  and later from soil, but no proven human cases have been reported . A strain molecularly identified as N. lorica “M. 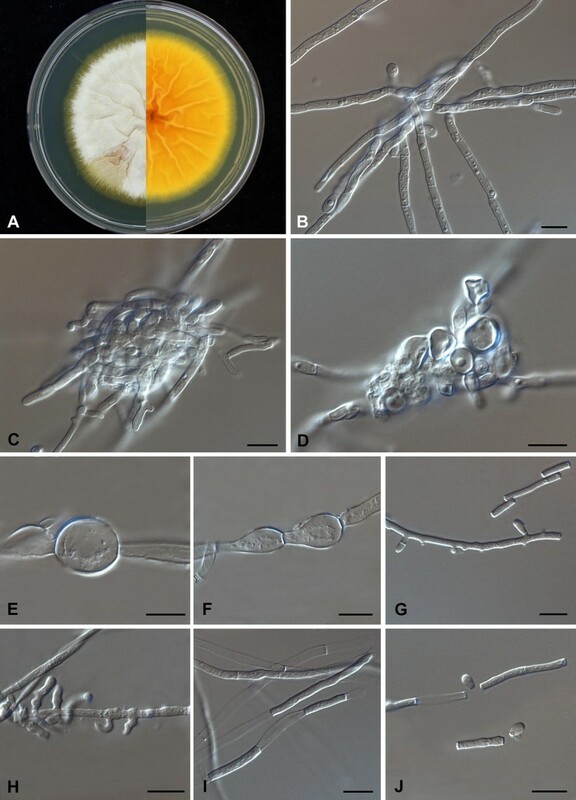 racemosum” was recovered from onychomycosis, but the identity of this strain could not be verified and no GenBank accession or reference collection is linked to the isolate . Nannizzia nana was originally reported from pigs causing chronic circular lesions on their ears [49, 50]. Human infections in the form of tinea capitis and tinea corporis occur through direct contact with the infected animals [51, 52, 53]. All seven strains analyzed in our study originated from humans, but the human host certainly has a sampling bias. With the exception of N. graeserae, the species which all are represented by a single strain, i.e., N. duboisii, N. aenigmatica, N. lorica, N. polymorpha, and N. perplicata, were all derived from human infections [14, 15]. The era of molecular taxonomy and phylogeny for this group of fungi started in the early 1990s, with an analysis of restriction patterns of mitochondrial DNA . The study revealed that Nannizzia species had distinct restriction patterns and this matched with subsequent ITS  and multilocus studies . Later, phylogenetic studies [55, 56] all demonstrated highly concordant topologies of trees, being largely insensitive to strain and taxon sampling effects. Nannizzia aenigmaticum was published separately as an etiologic agent of tinea corporis . The authors recognized eight species in Microsporum gypseum complex based on phylogeny of two loci, ITS and β-tubulin. Their analysis placed the new species closest to Microsporum gypseum and M. fulvum, which now are Nannizzia species. In our analyses, M. aenigmaticum is part of the Nannizzia gypseum group, as nearest neighbor of N. lorica. The latest described species, i.e., N. graeserae and N. perplicata, took an ancestral position in our ITS analysis [14, 15]. Our taxonomic study of Nannizzia supplemented earlier ITS data presented by de Hoog et al. and Zhan et al. . Isolate CBS 121947 proved to represent a hitherto undescribed Nannizzia species. Microsporum racemosum CBS 450.65 was described by Borelli in 1965  from the fur of a rat in Venezuela. Borelli was the coauthor of a paper describing the supposed teleomorph obtained after crossing of two strains from soil in Georgia, USA, which were deposited as isotypes of Nannizzia racemosa by Rush-Munro et al. in 1970 . The strains were, however, re-identified as Paraphyton cookei (syn. Microsporum cookei), a name preceding N. racemosa by two decades . 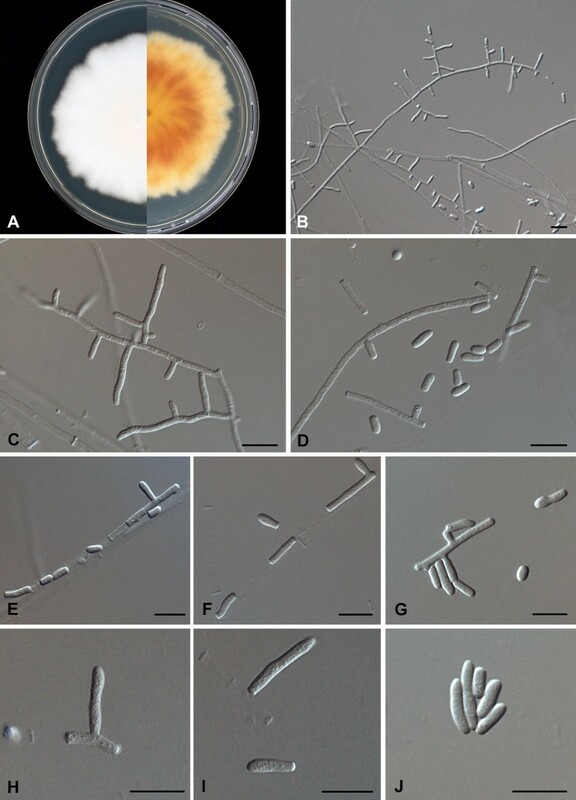 The strain CBS 450.56 is the type of the asexual species Microsporum racemosum which clusters in Nannizzia rather than in Paraphyton and which thus should be maintained as a separate species. However, since Nannizzia racemosa already exists as a synonym of P. cookei, a new name, N. lorica, is introduced here. 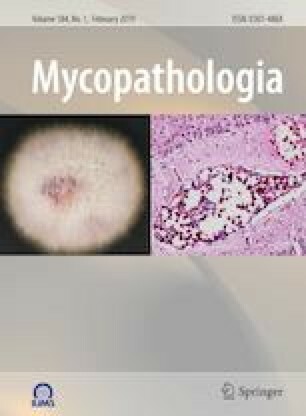 Another strain of M. racemosum causing an onychomycosis in a Spanish female was reported . 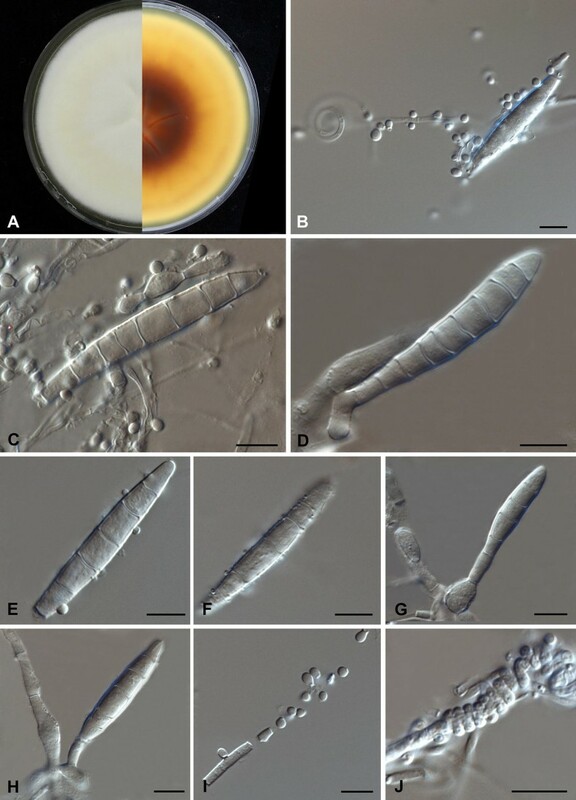 In this publication, the authors stated that the comparison of the ITS sequence identified the fungus as M. racemosum strain of Borelli, CBS 450.65. However, GenBank or CBS accession numbers or any other reference code of this strain was not published; thus, it could not be included in our analysis. Strain CBS 121947 from a facial lesion of a patient in French Guiana was morphologically identified as Microsporum amazonicum, but combined molecular and phenotypic features supported its identity as a novel species, described in this paper as Nannizzia polymorpha. Hubka et al. calculated degrees of sequence similarity between species for ITS and β-tubulin; the found values for these loci are comparable with the ones obtained in our study. In general, for all loci except LSU the distances between species are significantly larger than those between Trichophyton species. In an assessment of the phylogenetic power of five loci , ITS was shown to be the best locus for species identification in Arthrodermataceae, although precise borderlines between anthropophilic species still have to be determined. Morphological and physiological characters have been evaluated in Nannizzia to assess their discriminative value [25, 59, 60]. Teleomorph data are not useful for diagnostics, since species are heterothallic and the sexual states are highly similar between species. This is a general feature in Onygenales, where, for example, sexual states of Emmonsia, Blastomyces, and Histoplasma all have been attributed to Ajellomyces . Some Nannizzia species can easily be distinguished by their growth characteristics and the shape of their macroconidia. In general, Nannizzia species produce thin- or moderately thick- and rough-walled macroconidia with 2–8 cells. However, N. lorica and N. aenigmatica lacked macroconidial sporulation. 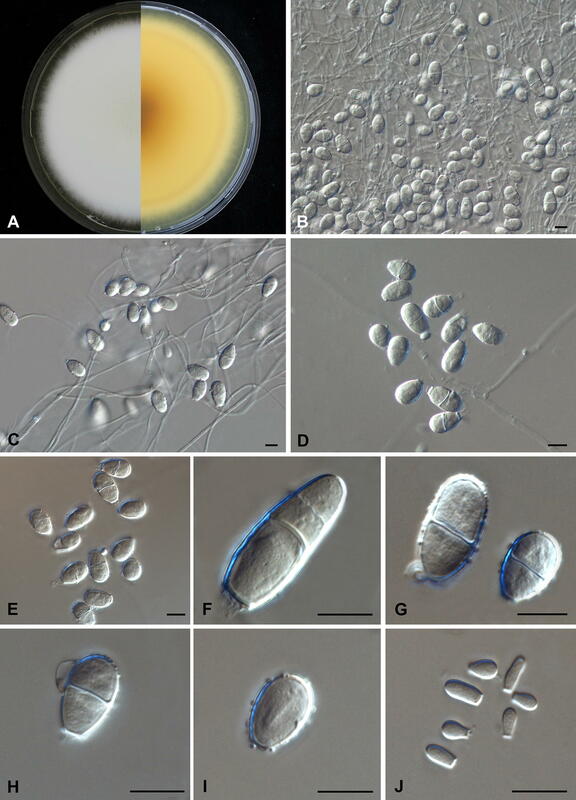 The species also produce abundant 1- or 2-celled, subspherical or ovoidal microconidia, except in N. praecox and N. aenigmatica where they were absent or scant. We combined morphological features with physiological activity of the strains to support species distinction and enhance routine identification. Despite elaborate morphology of most species, molecular identification remains indispensable since phenotypic characters are variable in all species treated. Nannizzia species grow on SGA plates supplemented with 0.2% cycloheximide. Dermatophyte test medium (DTM) invariably induced a color change from yellow to red in all tested strains . Urease test has been used to distinguish, for example, between Trichophyton mentagrophytes and T. rubrum . Eight Nannizzia species tested by Hubka et al. were urease positive. This corresponds partly to our results; negative or weak reactions at one of both time points were recorded in some species. Milk hydrolysis on BCP-MS-G has occasionally been used in dermatophyte diagnostics [24, 25] including Nannizzia species. Our results yielded variable reactions for all tested species, from negative to weak and positive. Some strains had a slow response, being recorded as negative on day 7 and positive on day 14 day. In addition of being strain-dependent, the color change was often difficult to evaluate, being concealed by colony growth and pigmentation. Lipase activity on TOTM was reproducible within strains, and we found some unambiguous correlation with the previously published results of Elavarashi et al. . The latter authors also tested hemolytic activity which was negative in N. gypsea. In our study, the hemolytic activity at day 7 was negative for all tested species expect N. aenigmatica, N. duboisii and the majority of N. nana strains were positive after 14 days. Hemolytic activity in dermatophytes has been regarded as strain-dependent , but in our study all species showed uniform results with this feature, except for a single deviating strain in N. nana and in N. duboisii (Table 3). In general, the diagnostic value of these four tests remains limited due to intraspecific variation and reproducibility. Growth at 37 °C is variable within some species as well, diminishing its discriminative power. Previously published results  discriminated N. aenigmatica and N. praecox from remaining species as being unable to grow at this temperature. In our tests, six out of ten strains of N. fulva were also negative, while the other four strains had poor growth. Poor growth was recorded for two in N. gypsea, one in N. nana and in N. duboisii. In conclusion, this study on the genus Nannizzia using phenotypic and molecular identifications has demonstrated that molecular methods are superior and the most reliable. All loci except LSU can be used for identification purposes. Macro- and microscopic features and physiology are not very informative; they are still useful for clinics with no molecular facilities. Our results showed that the physiological tests are even less informative than anticipated, due to the high intraspecies variation. The features of Nannizzia species described in this paper may reveal a higher prevalence of this species in the clinical settings which might be omitted or misidentified, thus helping in establishment of better epidemiological follow-up of these fungi.